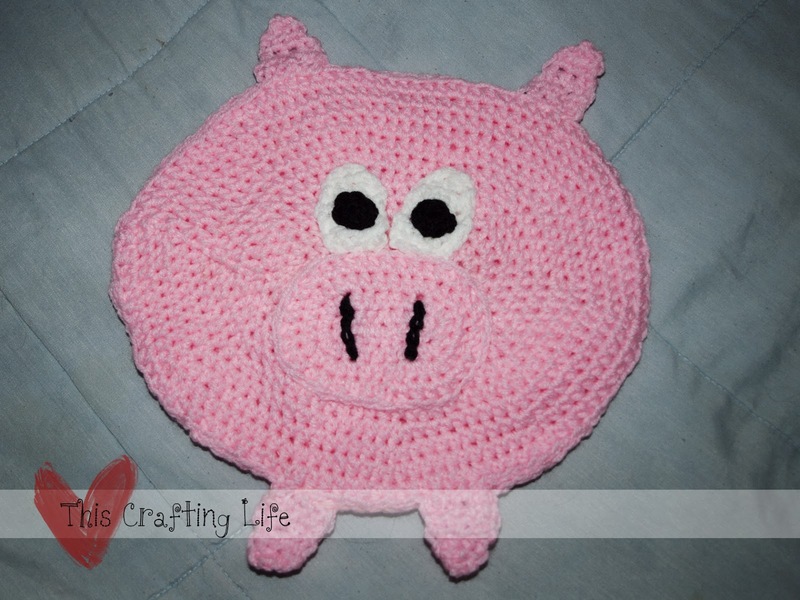 My mother loves pigs. She had asked me a couple of years ago to make her an oval trivet and I kept trying to make one work, and finally got something I more-or-less liked with this one. It really looked ok for a while, but I made it double thick(for heat tolerance), and when I added the second layer, I don't know if I just did a poor job of joining them, but I wasn't as pleased as I could have been with the edges. Mom loved it though (as a good mom should), and all is well. This pattern is really rough, I didn't write things down as I went along and am now writing them from memory. If you notice any errors or find any solutions to problems, feel free to leave me a comment and I'll make the appropriate corrections. R1: 4 dc in 2nd chain from hook, dc in each of next 7 ch, 5 dc in last chain. working on other side of chain, dc in next 7 ch, sl st in top of Ch2. R2: ch 3, dc in same, 2 dc in each of next 4 dc, dc in each of next 7 dc, 2 dc in next 5 dc, dc in each of next 7 dc, join to top of ch3. R3: ch 3, dc in same, dc in next *2 dc, 1 dc* repeat from * three more times, dc in next 7 st, *2 dc, 1 dc* five times, dc in each of next 7 dc, and join to top of ch 3. R4: ch 3, dc in same, dc, dc, *2dc, 1 dc, 1dc*repeat from * three more times, dc in next 7 st, *2 dc, , 1dc, 1 dc* five times, dc in each of next 7 dc, and join to top of ch 3. R5: ch 3, dc in same, dc, dc, dc *2dc, 1 dc, 1dc, 1dc*repeat from * three more times, dc in next 7 st, *2 dc, , 1dc, 1dc, 1 dc* five times, dc in each of next 7 dc, and join to top of ch 3. R6: ch 3, dc in same, dc, dc, dc, dc *2dc, 1 dc, 1dc, 1dc , 1dc*repeat from * three more times, dc in next 7 st, *2 dc, , 1dc, 1dc, 1dc, 1 dc* five times, dc in each of next 7 dc, and join to top of ch 3. R7: ch 3, dc in same, dc in next 5 st *2dc, dc in next 5 st*repeat from * three more times, dc in next 7 st, *2 dc, dc in next 5 st* five times, dc in each of next 7 dc, and join to top of ch 3. R8: ch 3, dc in same, dc in next 6 st *2dc, dc in next 6 st*repeat from * three more times, dc in next 7 st, *2 dc,dc in next 6 st* five times, dc in each of next 7 dc, and join to top of ch 3. R9: ch 3, dc in same, dc in next 7 st *2dc, dc in next 7 st*repeat from * three more times, dc in next 7 st, *2 dc,dc in next 7 st* five times, dc in each of next 7 dc, and join to top of ch 3. R10: ch 3, dc in same, dc in next 8 st *2dc, dc in next 8 st*repeat from * three more times, dc in next 7 st, *2 dc,dc in next 8 st* five times, dc in each of next 7 dc, and join to top of ch 3. R11: ch 3, dc in same, dc in next 9 st *2dc, dc in next 9 st*repeat from * three more times, dc in next 7 st, *2 dc,dc in next 9 st* five times, dc in each of next 7 dc, and join to top of ch 3. R12: ch 3, dc in same, dc in next 10 st *2dc, dc in next 10 st*repeat from * three more times, dc in next 7 st, *2 dc,dc in next 10 st* five times, dc in each of next 7 dc, and join to top of ch 3. R13: ch 3, dc in same, dc in next 11 st *2dc, dc in next 11 st*repeat from * three more times, dc in next 7 st, *2 dc,dc in next 11 st* five times, dc in each of next 7 dc, and join to top of ch 3. FO, leaving a tail for sewing two body pieces together. R4: ch 3, dc in same, dc, dc, *2dc, 1 dc, 1dc*repeat from * three more times, dc in next 7 st, *2 dc, , 1dc, 1 dc* five times, dc in each of next 7 dc, and join to top of ch 3. FO, leaving a tail for sewing on to face. Lines on snout- attach a strand of black yarn through the middle of the piece. Surface slip stitch crochet two vertical lines for the nostrils. R2: ch 3, dc in same, 2 dc in each of next 4 dc, dc in each of next 7 dc, 2 dc in next 5 dc, dc in each of next 7 dc, join to top of ch3. FO, leaving a tail for sewing to face. ch 3 and join to make ring, ch 1, 12 sc in ring, join to top of first sc, FO, leaving a tail for sewing. If you stitched over the starting yarn tail, you can pull tight to close the hole in the center. R1: dc in 3rd ch from hook and next 7 st. Ch 3, turn. R2: dc2tog four times. ch 3, turn. R3: dc in each of 4 st. ch 3, turn. R4: dc2tog twice. ch 3, turn. R5: dc2tog, fo, leaving tail for weaving in. Sew the black part of the eye onto the white part of the eye. Position your snout, eyes, ears and feet with pins until you're happy with the placement. Sew each piece on to the front piece of the body (not both pieces yet!) When you place the ears and feet, sew them about 1/4" below the top/bottom of the piece on the back side. When you join the back body piece, it will enclose them within. After all body parts are attached, sew the front piece to the back. 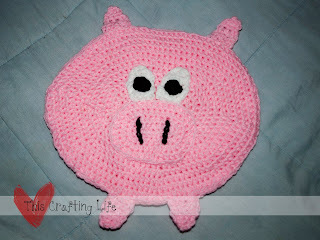 I recommend also stringing your yarn into the center parts of the pig and tacking the front and back together throughout.